We are looking to hire graduates from 2016-17 batch. Location – Chennai , Pondy, Tirunalveli, Salem, Madurai, Tanjore and Coimbatore. Role : Business Development Executive . Good Knowledge on LinkedIn and Excel-sheet. Experience : 1 Yrs to 3 Yrs. Qualification: Graduation with Good Communication Skills. 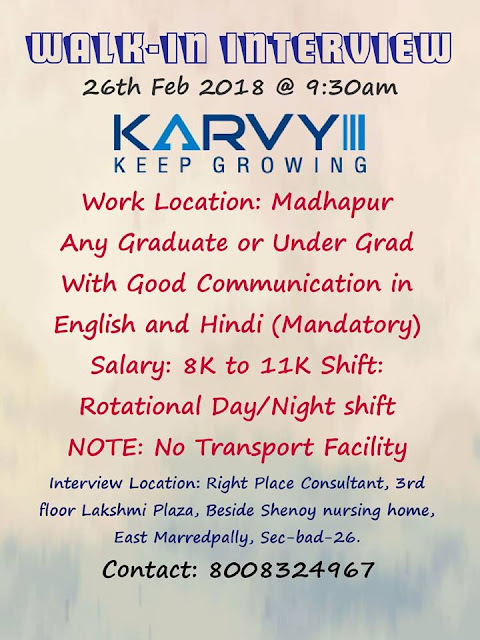 Interview location is Visakhapatnam and Hyderabad. 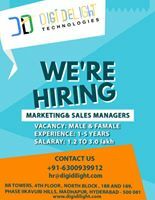 Interested candidates can send resumes to : operations_knl@trabajosolutions.com. Must be fluent in Hindi and English. Face to Face interview on 28-Feb-2018. General Shifts, 5 Days working. Lead Generation Executive for Training, HR Consulting, Content Creation and Event Management Division. As a lead generator, it's your job to set up appointments and find potential clients for the sales team. You're the first step in the prospecting process, and sales teams rely on your persuasive abilities and creative methods of finding potential customers. * Raw Data will be provided. Interested candidates can WhatsApp their profiles to 8074479861. Process : International voice process. Candidates can directly walk in from 27th Feb - 2nd March ( 11am - 4pm). 2. Senior Customer support executive. Location : Bangalore. We have few positions available. After Internship, full-time employment option can be availed. Email : contact@e2softwares.com Dont send Attachment. Please mention your details, and link to the app (if you have developed one), in the body of the email only. Please don't send an attachment. Interested candidates can walk in directly for the interview with their updated resume. Job Description : .NET developer responsible for building. Your primary responsibility will be to design and develop multiple layers of our applications, and to coordinate with the rest of the team working on different layers of the infrastructure. 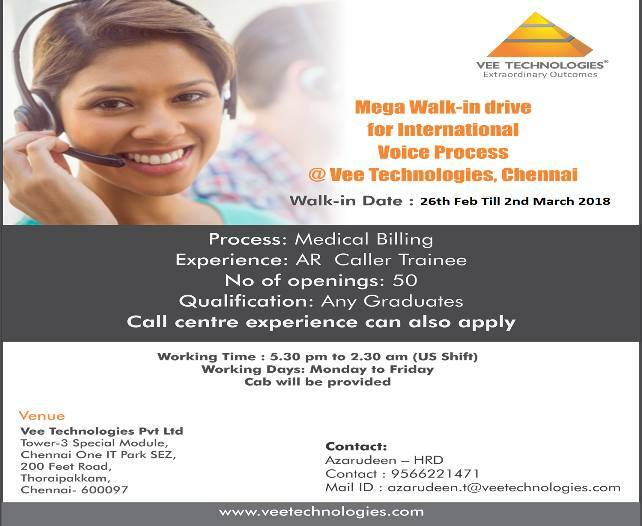 Walk in Interview Timings: 10:00 AM - 1:00 PM , No interviews after 1 PM. 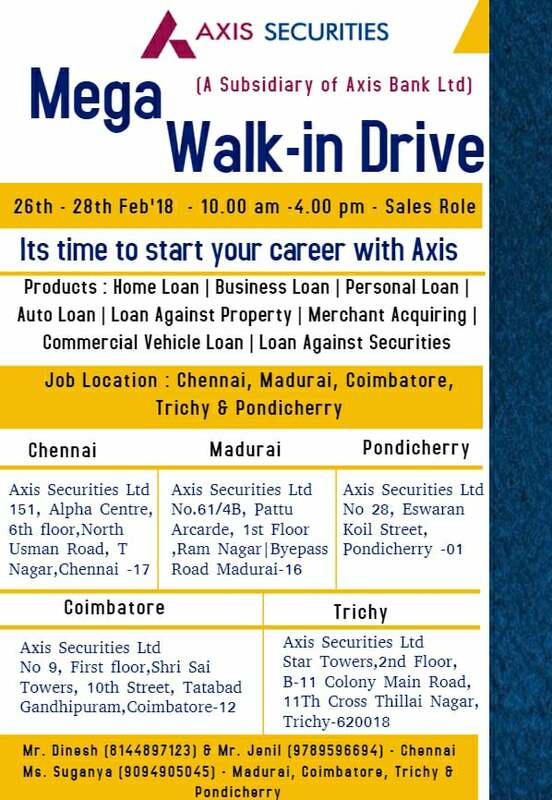 Walk in : Interested candidates can come directly for the interview on 24 to 26th Feb 2018 before 1 PM. Refer it to friends as well. Swiggy.com is hiring Delivery Boys all over Bangalore. Earn upto 25,000 Per Month. • Unit-testing code for robustness, including edge cases, usability, and general reliability. Salary : As per the Market. Reference would be great favour !!!!!!!!!!!! Contact Person : Sowmya - HR / Taurus Motors, Royal Enfield. Experience : 1-8 year / Freshers are also welcome. Salary : Not a constraint for right candidate. Organization : South Asia's premier courier Company. This will be an opportunity to work with the Premium Global Brand in Courier Service. Role: Pick and Delivery professionals across Chennai. 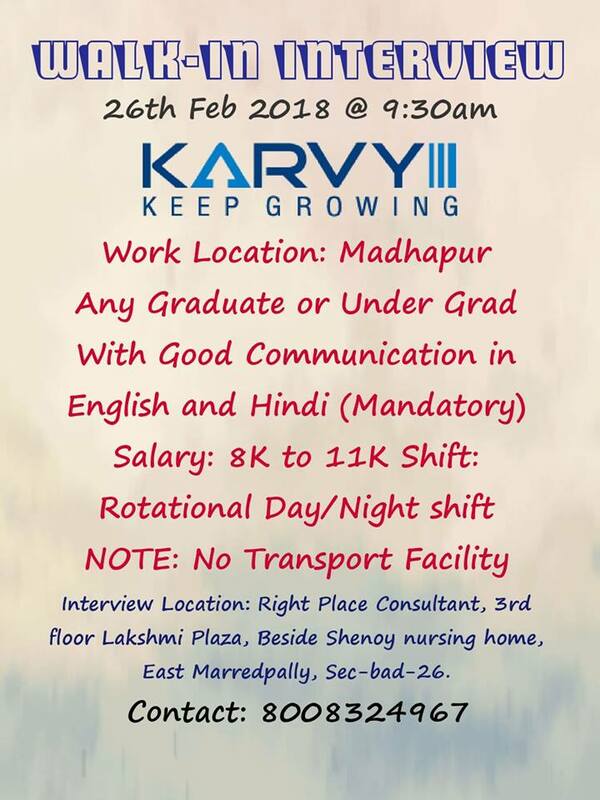 Excellent opportunity to build career. Mail your resume : subashyvos@gmail.com. Organisation : Tokyo Info Solutions India Private Limited is a multinational company with our base in India, United States, Canada, United Kingdom. we build and nourish a healthy working Environment where we focus on happiness & well being of Team Rather than individualism. Tokyo Group of Companies Include Granites, BPO, FMCG, Financial Market, Cosmetics. Additional Skills (Optional) Tech-Savvy, American Accent. GlobalShiksha.com is hiring dynamic and self motivated Outbound Telesales Executive. Client : Reputed health care company. Skills required: Excellent communication and good command over English. This will be an amazing opportunity for Fresher's with good communication skills and anyone looking to restart their career. Company : Cooper Stansted Ltd.
Salary : 15000 CTC pm. Recruitment for B.E ( EEE and ECE) for a leading MNC. The Company was initially incorporated in the year 1937 and fully owned by Stewarts&Lloyds Stewarts &Lloyds of India Limited ( S&L) is multidisciplinary company engaged in providing engineering and construction services in a varity of sectors including Metal, Hydrocarbon, Power, Fertilizer etc. S&L has Seven decades of extensive experience in the area of piping engineering and one of the leaders in piping and fluid handling, backed by expertise in welding and has stood the test of time in the field of pipe work engineering. From pipe work engineering, the company has diversified to a multi-discipline construction company for Fluid handling and Allied systems serving a host of core industries. Its engineering capabilities derive strength from its own ISO certified Design & Engineering Wing. At present, the company is in process to build up a new manufacturing unit at Orgram, Burdwan, in the West Bengal since the old two manufacturing units at Khidderpore & Jhin Jhira Pole have since been non-operative in the process of law. Qualification: Candidates should possess Full Time B.E/ B.Tech(Engg.) from recognized University with minimum 50 % marks. - Eligible candidates will be required to appear for a Written Test, information for which will be provided in the Admit Card. - Candidates shortlisted on the basis of their performance in the Written Test will be intimated to appear in Interview. - Basic salary of Rs. 24, 900/- (Scale of Pay Rs. 24, 900 - Rs. 50, 500). In addition, Dearness Allowance (DA) based on IDA pattern is payable. - House Rent Assistance, if applicable will vary based on the class of city of posting. Job Location: All India (Project Sites). BE009 Scientist/Engineer 'SC' (Architecture) 01 (1-OBC) Bachelor degree in Architecture in First Class with an aggregate minimum of 65% or CGPA 6.84/10 and registration with Council of Architecture. Eligibility: Candidates who are going to complete the above course in the academic year 2017-18 are also eligible to apply, provided final degree is available by 31/8/2018 and their aggregate is 65% marks or CGPA 6.84/10 (average of all semesters for which results are available). The qualification prescribed and the benchmark are only the MINIMUM requirement and fulfilling the same does not automatically make candidates eligible for Written Test. Candidates who apply for the post code No.BE009 will have to produce the Registration Certificate for having registered with the Council of Architecture, at the time of Interview, failing which he/she will not be allowed for interview. Age Limit: 35 years as on 05.03.2018 (40 years in case of SC/ST candidates and 38 years for OBC candidates, against posts reserved for these categories). Ex-Serviceman and Persons with Disabilities (PWD) are eligible for age relaxation as per Govt. of India orders . In case of submission of duplicate/multiple applications by Women candidates/Scheduled Castes (SC)/ Scheduled Tribes (ST); Ex-serviceman [EX] and Persons with Disabilities (PWD) candidates, the last application submitted before the last date for submission of application shall be considered for further processing. 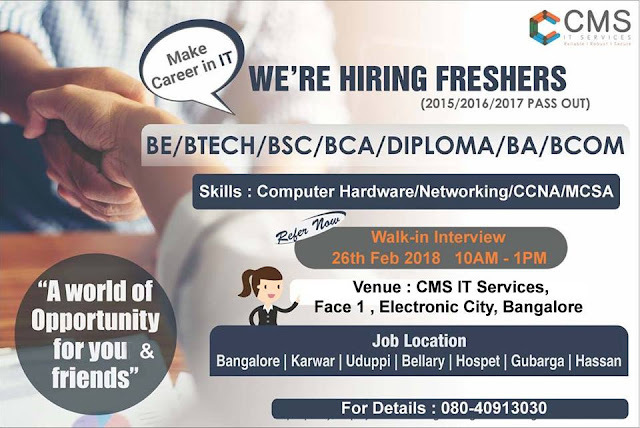 Read full details in the link below and apply. BE/B.Tech or equivalent qualification in first class with an aggregate minimum of 65% marks or CGPA 6.84/10. Candidates who are going to complete the above course in the academic year 2017-18 are also eligible to apply, provided final degree is available by 31/8/2018 and their aggregate is 65% marks or CGPA 6.84/10 (average of all semesters for which results are available). The qualification prescribed and the benchmark are only the MINIMUM requirement and fulfilling the same does not automatically make candidates eligible for Written Test. Age limit: 35 years as on 20.02.2018. Ex-Servicemen and Persons with Disabilities are eligible for age relaxation as per Govt. of India orders .